As a child i grew up addicted to sport, anything that i could try my hand at i gave a go. However i always had one annual event that always took my imagination; The FA Cup Final. At the age of 2 and a half my first ever memory was of my dad and all his mates returning to the house head to toe in read and white stripes singing and dancing. They were celebrating, drinking plenty but the vibes that were between my wood chip walls and atrocious 70’s decor will live with me. In 1973 Sunderland (the underdogs) beat the mighty Leeds United at Wembley in an FA Cup Final. Through the years i always remember sitting down at 12 noon with my dad and brother Graeme and we watched every moment of the build up and every second of the match. In 1992 i was lucky enough to live my childhood ambition, to play for Sunderland in a FA Cup Final at the tender age of 21. A memory that i will take to my grave and surely the proudest moment of my life???? Do you see the other piece of metal sat to the right of the solid gold, royal mint FA Cup Final Medal? Let me put this in perspective the FA Cup Final doesn’t even come close to the achievement of completing an IronMan. I get asked constantly about the final and i puzzle people when i describe the difference between the two. In simple terms – Football is a team game, players can hide, I was a forward and i may have had a horrible week at training, had the odd day when i decide to go easier than normal and on the saturday i was in the right place at the right time and score the goals and get the headlines. Within the Ironman or any individual sport its about you and only you, if you fancy a lazy few days you only cheat yourself. 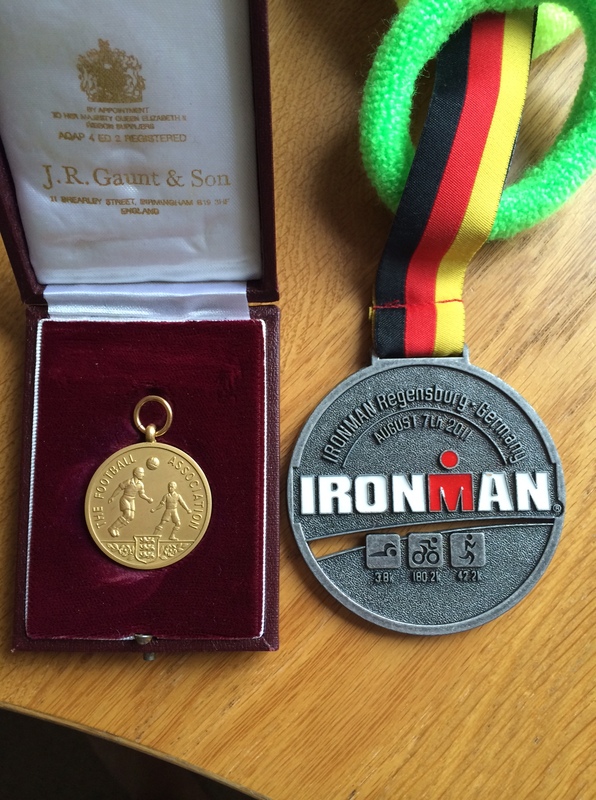 Don’t get me wrong i am very proud of the Cup Final medal, however the IronMan one dwarfs it more than 10 fold. PS – It was put to me once – Am i the only person with both these medals?